I am an old school gamer. 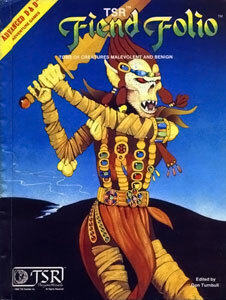 The first gaming book I ever looked at was the Fiend Folio released in 1981. This book set the stage for me. The artwork was Lovecraftesque and those brits know how to make creepy monster. Player 1: I search for Traps. Player 2: I search for Hidden doors. Player 3: I search for treasure. Player 4: I search the dungeon!!! The players then roll the search skill and who ever rolls highest wins (not who rolls a successful search skill). So the game master slows and takes each one in stride. Who is searching for traps? Ok, this is what you notice. Then the next section is addressed. Who is searching for hidden doors? Ok, you find a secret door and it leads to the next room. GM: [Describes the room] What do you do? Player 1: I'm going to the north wall and searching for any seams that may indicate a secret door. Player 2: Yeah, I'm going to do the same on the east wall, but since its a flagstone wall unlike the others, I'm going to press on the flagstones to see if there's a hidden switch. Player 3. I'll help out by searching the south wall. Player 4: and I'll take the west wall. DM: Player 1, the north wall is smooth stones. If there are any seems, a master dwarf mason would have to spot it. Player 2 you find a loose flagstone, it doesn't appear to be a switch but it appears you can pry it loose. Player 3, you find an iron ring set into the wall. You see the seems of the block it is set in and it appears to be a 3 foot by 3 foot section of the wall. Player 4, the south wall is as non-nondescript as the north wall. Player 3: Hey guys I found a ring. *Is it a like a prison ring to shackle someone? DM: You see grate marks on the floor, as if it has been pulled out a drug across the stone floor. Player 3: Hey Player 1, you're pretty strong. Can you pull this out? Player 1: I attempt pull out the stone. GM: You pull out the stone block which turns out to be a 3 foot cube. Player 2: Wait a minute, I look closely at the ceiling to see if I notice anything. GM: In the shadowy darkness of the ceiling you can barely make out a black square. You believe that if you stand on the block, you could peer into the abyss. There may have been some rolls mixed in there, but you never really knew if was a roll to reveal something, or just a roll to throw you off. Suffice it to say, you would immerse yourself into the world more, where now you seem to immerse yourself into the rules. You spend a large amount of time scouring the rules for something that would be useful, or else you pick up something that you might be able to in some rare situation. Mind you this all prior 4th edition. The latest and greatest edition of D&D appears that it would help go back to that old style gaming; Combat is set, stream lined, no arguments, and everything is spelled out. Well not exactly, 4th edition suffers from information overload, and most of it in regards to combat maneuvers. Sure its easy to run a combat, but honestly, you have no leeway to actually role-play. Desription: [...] The fireball fills an area equal to its normal physical volume (roughly 33,000 cubic feet -- thirty-three 10' x 10' x 10' cubes). How many of you just looked at the 20' radius and made the grievous error of casting fireball in a dungeon? That was a good session and one I still recall 20+ years later. The dawn of understanding on all of our faces and the ensuing argument as we had to run from the dungeon we were exploring. I recall a similar incident in Shadowrun where the dwarf mage my friend was playing misread the area of effect as 3 feet per level as opposed to the 3 meters per level that it was. After casting the spell the GM asked all of us to make resistance tests and all the razors in the party promptly crumbled to the asphalt. After confirming the mistake, my friend apologized profusely but we never let him live it down "Dive for cover, he's casting a spell!!!" I believe it is these moments that are lost with an expansive rule-set. When players immerse themselves in their character sheet and not the world they are gaming in. Where actions are determined by a roll of the dice and not by actual actions. When you stop describing new ways for your fighter to swing his sword and settle for saying "I swing my sword, or I play this action". As always, your travels may vary. Please take what you like and leave the rest for the next traveler.